Posted on January 12, 2013 by mimijk •	This entry was posted in discretion, friendship, humor, life lessons, love, mindfulness, music and tagged joy, Magic, Sleight of hand, Tinker Bell. Bookmark the permalink. I also believe in magic–and loved Tinkerbell when I was a kid–in fact I was so jealous that they finally made a movie about her when I am so ancient now–when I was young I would have given my eyeteeth for a movie about her. Without magic or the feeling of magic, what is there? Seriously sometimes I believe we are blog sisters–we have so much in common. And I too think it was just wrong that an entire generation of kids who clapped really hard during Peter Pan when he asked us to help ‘heal’ Tinkerbell by believing, had to be denied a movie about her. Just wrong – I will have to wait until I have a little person in the family, and then you can bet that movie is going to be in the video library. I, too, am a believer in the magic of simple surprises and moments that delight. A baby’s belly laugh is way up there, the antics of my dogs when they’re playing, that moment of unbelievable resonance when the song that most perfectly captures your mood pops up on the radio, the joy of an unexpected call from a friend when you’re feeling like no one understands or cares–these are magic. Your post reminds me of a quote by Mother Teresa: Be faithful in small things because it is in them that your strength lies. Faith is magic..however one defines faith. Yes it is. I’m a believer. A million times over. My family is always teasing me about how excited I tend to get over the smallest things. It’s who we are … right? We are constantly entertained by our surroundings and performers love when we show up in the audience. It’s a win/win. Great post! I love that Mother Teresa quote above. We really are the best audience..And yup, David’s Mother Theresa reference is beautiful. This post is magic, along with the thoughtful comments it provokes. This is the type of magic that fills us with peace for the moment. Thanks, Mimi, enjoy much magic this weekend! And if we find peace in the moment and string those moments together, what magic!! 🙂 Thank you Fran – as always..enjoy your weekend too! Don’t question what it is in your makeup that allows you to retain the childlike pleasures – just continue to enjoy them! It generally takes a moment of animal magic to remind us of the fun in life? You have your very own Tinkerbell – you lucky lady!! And I have a hunch she always redeems herself when she lets you down – Tinkerbells can do that! We lose an awful lot of amazing moments without holding on to the conviction!! I am often saying, “oh, it’s the little things” when I find myself marveling at things that feel like magic, or at the very least…serendipity, which is sometimes almost as good. Like Lori said, when a song come on and it matches a mood, or even better, when a set of lyrics mimic our thoughts or feelings of the moment, I trust that this is not just coincidence, but something larger at play, remind us we are part of something bigger than us. And to this: “I can’t explain how these friendships have formed, why these conversations are often more enriching than those that occur in face-to-face dialogue. I leave it to magic – for magic allows for that which should remain inexplicable, fantastic” I say amen sister! 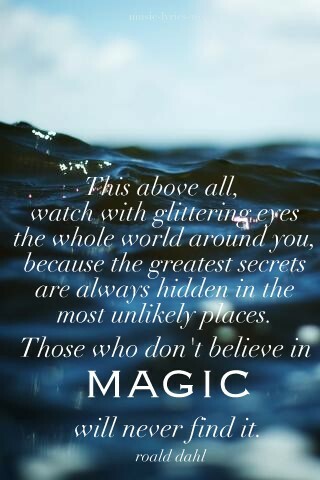 The magic of the everyday ordinary is all around us and then there is the other magic that we create in our minds and if we are lucky we allow ourselves to believe it just a little bit. Near the end of the summer when we got three little blueberry bushes and planted them in our back yard, I told the boys that in the evening and in the early morning light, those bushes would wiggle their roots up and out of the dirt and dance and dance and dance as only a blueberry bush can dance. It is a magical dance that we will never see but we can believe that it happens and it filled the boys with awe and wonder and respect for our three little blueberry bushes. I like to think that maybe, just maybe they do dance. And perhaps that is why their berries taste so good. Silly maybe, but I would have it no other way. I choose to believe they dance and they taste better than any blueberries anywhere because of the family that tends to them..
Ah, thank you. You are so blueberry sweet! I’m very very appreciative of your comments Lynne – thank you so much! What? Tinkerbell isn’t real? Great post. Keep them coming. Blessed be.